Please note: For reasons of safety we are unable to accept prescription requests over the phone. From the moment we receive the request, we require 48 working hours (weekends are therefore excluded) to process your request. Please allow sufficient time to order your medication. What if you don't have Online Access? In person - please use the tear off portion of your prescription to tick the items you need repeated and drop it off in the grey post box in the main foyer labelled Central Surgery. By post - If you wish us to return your prescription by post, please enclose a self addressed stamped envelope. Online – via the link at the top of this page. This is only applicable if you have registered for the Patient Online Access. Pharmacy Collection Service - Many pharmacists now run schemes to collect your repeat prescriptions for you. Please enquire about this with your pharmacist. Only medication that has been agreed by the doctor can be requested as a repeat prescription item. Should you require an item that you have had in the past but is not on your repeat medication list, please book a telephone consultation with a GP or a Nurse Practitioner. If you are on regular medications and are stable, your doctor may be happy to prescribe medication without you having to contact the surgery each time. With these prescriptions you can collect your medicines from the pharmacy at regular intervals for up to 12 months. Your doctor will decide how often you should collect your prescription and how long it will last for click here to find out more. We work hard to ensure our prescribing is of high quality and we will prescribe medicines that are effective, safe and provide value for money. Our surgery complies with local and national guidelines, therefore, there may be a time when your medication will be changed in light of new evidence. Should this apply to you, we will endeavour to keep you fully informed and answer any queries you may have. Patients on repeat medication will be asked to see a doctor, nurse practitioner or practice nurse at least once a year to review their regular medications and a notification should appear on your repeat slip. Please ensure that you book an appropriate appointment to avoid unnecessary delays to further prescriptions. Are you taking Pregabalin or Gabapentin? These drugs have now been re-classified as Controlled Drugs (CDs) following a government consultation. 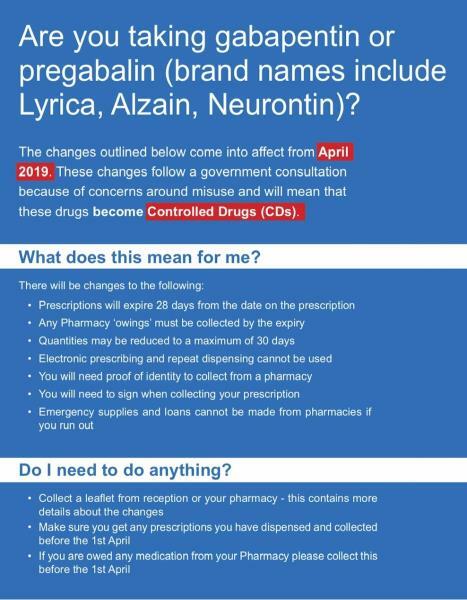 Please see the attachment below for the changes with Pregabalin and Gabapentin. Please click this link OTC for medications available over the counter at your local pharmacy and that are not prescribed by the surgery. PPCs are available by 10 monthly direct debit installment payments. The certificates allow anyone to obtain all the prescriptions they need for £2 a week. Find out more about the prescription prepayment certificate. Do not leave it too late to order or collect your repeat prescription this Christmas. 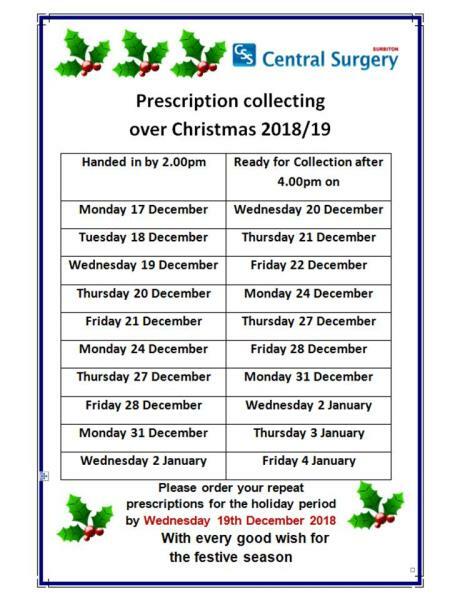 Please see below for the order and collection dates over the festive season. Ensure that you are prepared with sufficient over-the-counter remedies so that minor illnesses and injuries can be managed at home. Local pharmacies can provide useful advice and deal with minor ailments without people having to see their GP about winter bugs like coughs, colds, sore throats, stomach upsets and flu.